Rhode Island covers an area of approximately 1,214 square miles which is bordered on the north and east by Massachusetts, on the west by Connecticut, and on the south by Rhode Island Sound and the Atlantic Ocean. It shares a narrow maritime border with New York State between Block Island and Long Island. The mean elevation of the state is 200 feet. Nicknamed the Ocean State, Rhode Island has a number of oceanfront beaches. It is mostly flat with no real mountains, and the state's highest natural point is Jerimoth Hill, 812 feet above sea level. Narragansett Bay is a major feature of the state's topography. Block Island lies approximately 12 miles off the southern coast of the mainland. Within the Bay, there are over 30 islands. The largest is Aquidneck Island, shared by the municipalities of Newport, Middletown, and Portsmouth. 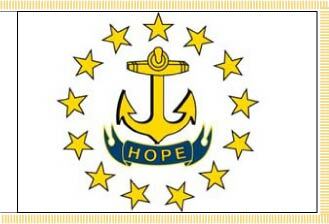 The second-largest island is Conanicut; the third-largest is Prudence.